Jaipur is famous among travellers for its old-world charm and the fact that it’s a beautiful gateway to the state of Rajasthan. The city was painted pink during the visit of the British royalty and since then is popularly called the Pink City of India. Overlooking the Tonk Road, the city’s business hub-street, lies Hotel Royal Orchid, Jaiour which is the only hotel in Jaipur with eight plunge pool rooms. It is located just a few minutes away from Jaipur International Airport and Railway Station, and has numerous places of interest, like Jal Mahal, Hawa Mahal, Jaipur Exhibition and Convention Centre, and more within a 15 km radius. With vast banqueting spaces, Hotel Royal Orchid, Jaipur is the preferred destination for both weddings and corporate events. It has 139 rooms and suites, classified into Club Rooms, Deluxe Rooms, Plunge Pool Rooms, Suites and a Suite with pool. It features three dining outlets: Tiger Trail- a restaurant serving Indian delicacies, Limelight- an all-day multi-cuisine café and Salsa Bar- a multi-cuisine bar lounge. The hotel also has a beautiful rooftop swimming pool, along with a gym. An interesting play of wood and concrete, this category of rooms, offers a vibrant contrast of bright walls and pastel interiors. They feature amenities such as twin or queen-size beds and a workstation over an area of 337 sq. ft.
Our well-appointed club rooms give you a choice of twin or queen-size beds along with complimentary airport pick-up and drop facility. With a living space of 585 sq. ft., these 9 charming rooms have private plunge pools with exclusive access. 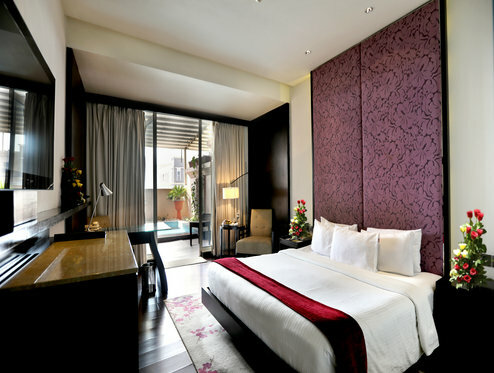 They come equipped with an attached balcony, comfortable beds with fresh linens, a lounging chair and lamps. Overlooking the gardens, the plunge pool suite at Hotel Royal Orchid, Jaipur is the most spacious category of accommodation with a living area of 800 sq. ft. They come attached with a private plunge pool and have a relaxed seating area outside. The large suites, with an area of 710 sq. ft. each, are designed to escalate guest experience to luxury. They are elegantly decorated with soothing colours and rich interiors. Each suite offers a pleasing view of the city. Be it the seriousness and professionalism required for a business gathering or the vibrancy and festivity required for any large-scale social event such as a wedding, our team is adept at handling all the planning with ease.